This is a passionate love affair which I have conducted over many years; some cheeses have been loved and lost (smoked cheddar – given up around the time everyone gave up smoking oddly; Halloumi – how I loved your grilled squeaky deliciousness) and as we all know true love lasts a life time. On the other hand, too much of a good thing can turn into a bad thing and around ten years ago I realised, with some sadness, that a choice had to be made; it was either size 14 jeans or cheese in the fridge. I heaved my cheddar-gorged (geddit?) personage onto the cheese wagon. But as anyone who knows me will tell you, I am neither a saint nor a martyr. I do not believe in denying myself certain treats. If you were to poke around the cupboards in my kitchen (give them a wipe while you’re there will you? ), you would soon discover that I have a not-very-secret penchant for Double Deckers and Aldi own-brand Pringles. 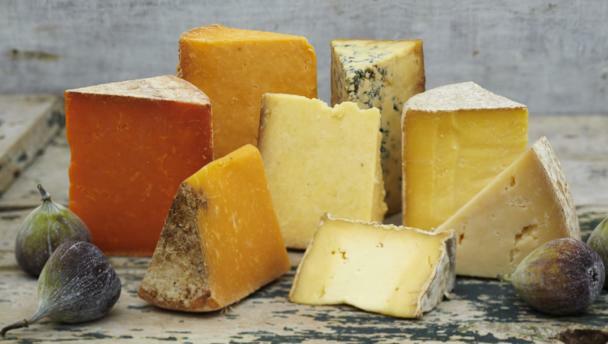 But cheese is my weakness; my nirvana, my downfall and my favourite. Therefore, it will not surprise you to learn that occasionally I fall off the wagon. This usually happens at Christmas. For Christmas is the time to eat first and ask questions later (or ideally drink too much egg-nog so that you forget what the actual question was). This Christmas I really went to town with the cheese. We had guests staying before and after Christmas, so my daughter and I made our annual pilgrimage to the cheese counter at Waitrose. We like to go here because they let you try the cheese and if you time it just right that’s lunch done as well; they don’t even mind if you bring your own biscuits. Anyway, I digress. We got a little bit over-excited on this visit, deciding that we needed at least three types of cheddar, two types of blue-veined cheese and so on (but not that disgusting cheese with fruit in it which is wrong I tell you, plain wrong). So we returned home with our little piece of cheesy heaven, excited and ready for a feast. However, our first guests didn’t eat any mainly because I forgot to get it out of the fridge (an honest mistake I promise) and despite a royal effort from our second group of guests, there was still a small cheese mountain left after the festive season had passed. It fell to my daughter and me to polish it off. Now, we take our cheese-eating very seriously. There is no butter allowed but you have to eat it with biscuits, home-made chutney (see my last post before Christmas for the recipe – it is really rather good) and perhaps some grapes and an apple (to convince yourself that it’s an entirely health-giving snack). By the second week of January, our work was nearly done. The problem arose when I caught a glance of myself in the mirror. No amount of sucking-in and standing sideways could hide it. There was extra me and I did not like it one bit. Now everyone gets this after Christmas don’t they? It’s no surprise that the weekend supplements and bookshops are filled to the rafters with supposedly innovative suggestions on how to lose weight (eat less) and become more healthy (exercise more). It’s not rocket salad but actually that does help too. My marathon-running friend who I have known all my life and who does not suffer fools, responded to my whingeing about not liking running and it being a bit chilly out with the words, ‘get off your fat arse and get on with it.’ Only your oldest friends can address you in this way. Fair point, I thought, hiding an open bag of Hula Hoops behind my back. Another kinder friend recommended the ‘Couch to 5K’ app to me. She told me that it was easy to follow, encouraging and ‘not as knackering as you might think’. I was therefore caught in a perfect storm of compelling reasons to give running a go. I already swim and flirt regularly with Pilates (my husband is very understanding) so I decided the time was right. One cold, brisk lunchtime when the icy drizzle had passed and my morning’s quota of words had been met, I decided to go for it. Despite realising that I didn’t own a sports bra, that my gloves had a hole and my tracksuit trousers didn’t reach my ankles, I pressed on like a woman possessed. I squashed my bobble hat onto my head, grabbed my iPod, left the house, locked the door, walked a few steps, went back to check I really had locked the door and then pressed ‘play’ on my iPod. The lady on the podcast is called Laura. She sounds like the kind of woman who would instantly be your best friend; she would help you go shopping for shoes and encourage you to try something daring; she would probably order a fish you’d never heard of in a restaurant; she would make an ideal girlfriend for your younger brother and never flirt with your husband. She told me to walk for five minutes, so I walked for five minutes. She told me to get ready for my first run, she told me I could do it, she counted me in and off I went. She played me punchy music to give me impetus and one minute later she told me to walk for ninety seconds. I followed her instructions to the letter and she told me I was doing great. We ran, we walked, we ran, we walked and actually, I enjoyed it. I forgot about the hole in my glove and all the things that addle my fevered brain. It was just me and Laura running together; me getting rather out of breath and her staying cool and supportive mind but nonetheless, we were a team. I arrived home twenty minutes later feeling exhilarated, alive and utterly knackered. Later that evening I experienced the most unspeakable cramp, the next day the front of my legs were really quite sore but do you know what? I don’t care. I’ve run for the first time in my life without hating it and I have a new best friend called Laura. The cheese is gone and the potato is off the couch, rolling down the hill with breathless glee. This is AMAZING. I love your posts, they make me giggle so much! I also cry and adverts with penguins and anything where people make their parents proud. I also cry at adverts with old people and pets (that goddamn Cesar advert!) Good luck on your cheeseless journey to health! I did couch to 5k after never running and hating running with a passion- now I run three times a week and am training for a 10k race! Woo! You are not sluggy!